This guidance is on internal plasters. There is a range of choice. Consider the different types of plaster depending on the background surface and the desired finish. Bonding– it is a gypsum based undercoat plaster for low suction backgrounds like tiling, dense concrete blocks, engineering bricks, concrete, plasterboard surfaces. An undercoat means one coat or base coat applied on a wall to prepare it for top coat or finish plaster. It cannot be used on the absorbent surfaces. Latex SBR adhesive can be applied before bonding plaster. 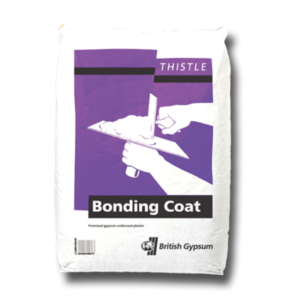 Thistle bonding coat– undercoat plaster for most smooth or low suction backgrounds. Perfect for tiling, concrete, plasterboard or surfaces treated with Thistle Bond-It. Coverage based on 11mm thicknesses. Hardwall- it is a gypsum based undercoat plaster used for more absorbent surfaces (mostly on masonry) than bonding. It offers a higher impact resistance and quicker drying. Higher than normal resistance to efflorescence and gives a durable base for the application of decorative finishes. Thistle hardwall– it is a premixed gypsum undercoat plaster for smooth surfaces or low suction backgrounds. High impact resistance and quick drying makes it suitable for most masonry backgrounds like common bricks, medium density and aircrete blocks. Suitable for use by hand or mechanical application. Coverage is based on 11mm thickness. Multifinish– it is a top coat plaster which is suitable for plasterboard surfaces. It can be used as the finishing plaster. 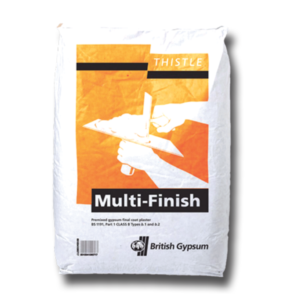 Thistle Multifinish– it is the most versatile finish coat plaster and it provides a plaster skim finish on most common backgrounds including undercoat plasters, plasterboards and smooth concrete surfaces. Suitable for application by hand or mechanical application. Coverage based on 2mm thickness. It is the perfect choice for plasterers working on both undercoat and board backgrounds on the same job. Its flexibility makes it ideal for small repairs or patching. One Coat Plaster– it can be used on various surfaces. Ideal for filling larger holes and patching. It can be built up to the thickness of 25mm, coverage thickness of 11mm. It gives an ideal smooth finish if applied on plasterboards. It provides the white surface for decoration purposes like painting or wall-papering. 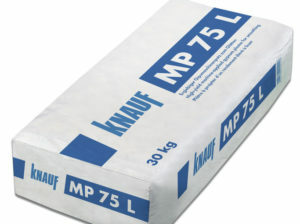 Knauf MP75 Projection Plaster– it is a one coat plaster designed for the machine application. It can be applied up to 20 mm thickness. Suitable for use directly on the clockwork, with drying time of approx 3-4 hours, it provides the white and smooth surface ready for the decorative finish. In case of machine application it gives an excellent productivity with up to three times faster time of realisation than in the case of hand application. Undercoat plasters are usually 11mm thick and all other plasters are 2mm thick. For hard surfaces and bad walls use bonding or hardwall first, followed by two coats of multi finish. One coat plaster is perfect for patching and applications on plasterboards. Tiles should not be applied directly to Thistle undercoats except of Thistle Dri-Coat. Use flatness guide – 6 or 10mm- it allows to achieve the ideal thickness and smoothness. To buy plasters call IBB Builders Merchants or order online. Check out the May 2017 edition of IBB Builder for more information on internal plasters and the comparison table. 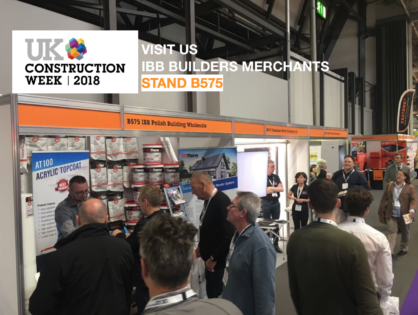 IBB Builder provides excellent advertising opportunities for construction related businesses and is a great way to reach local building trade. The magazine will be read on regular basis by IBB Polish Building Wholesale customers, builders, architects, developers and all involved construction industry.